Sky+ interface gets Sky Q features with latest update | What Hi-Fi? Sky has announced a number of updates that will be making their way to Sky+ boxes over the next few weeks, including a number of new features that launched with Sky Q. The homepage of Sky+HD will be given a slight makeover following the update, most notably with the addition of a new ‘Top Picks’ section. Top Picks is already available on Sky Q and provides you with recommendations for what to watch based on your TV packages. A new ‘Download Next’ feature will also arrive with the update, automatically downloading the next episode of any box set that you watch. The new Continue tab meanwhile will allow you to pick up where you left off with any given episode. Other small updates to the Sky+ interface include a newly designed Services page and the addition of a progress bar that will show you how much of a recorded programme you've watched. Radio stations will get a new Radio tab in the TV guide, while the search bar will move to the top of the homepage to make it more prominent. 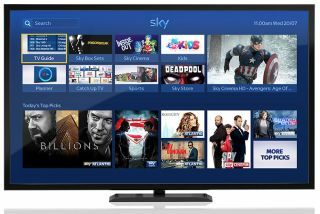 Sky has said Sky+HD customers with their box connected to the internet should start receiving the automatic update from today, with the full roll-out across all Sky boxes likely to take until the end of August.